Luc Buée is a French scientist (CNRS Research Director). 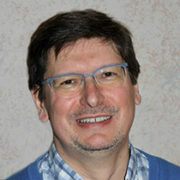 Head of the Inserm laboratory « Alzheimer & Tauopathies » at the Jean-Pierre Aubert Research Centre, University of Lille, France. His group is also part of the laboratory of Excellence (LabEx) DISTALZ. He has worked on Alzheimer disease and related disorders for twenty five years. He started his work on the role of proteoglycans in Alzheimer disease with a PhD training at Mount Sinai Medical Center, NYC. He was then involved in the initial characterization of tau aggregates among neurodegenerative disorders. He has then developed experimental models to better understand the role of post-translational modifications in tau aggregation. His group is currently working on the pathophysiological consequences of neurofibrillary degeneration and their links to the amyloid pathology in Alzheimer disease. His group was/is also involved in different international consortia. Luc Buée is also involved in different scientific advisory boards and is the vice-president of the French Society for Neuroscience.